In part one of this article we asked the question Why would you want to conduct business in Virtual Reality? and looked at some of the options now available with Social VR apps. In part two of the article we will ask how, and dive deeper into some of the tools available to the business innovator. But first, who are these business innovators? We know that VR is being used in a whole range of different industries: Estate Agents, Architects, HR managers, Pharma reps, and many other business leaders recognise the advantages of VR. Training new staff in potentially hazardous tasks is safer in VR; gathering business leaders from around the world in the same room without the travel expenses makes loads more sense; the advantages are clear and obvious. So, if it’s all so great, why aren’t we all prancing around in Virtual Offices in our fancy avatar suits then? That’s a good question, and thanks for asking. The answer is barriers to entry; that classic wall of nope that is constantly thrown up by clients and account managers every time you open your mouth with your amazing ideas about innovation. It’s frustrating, but also a valid issue that has to be addressed. The main barrier to entry we smash our faces into in the Immersive industry is hardware; putting VR headsets onto your clients to demonstrate the benefits of VR is usually the main stumbling block. If you do manage to persuade them to put the thing on, and they don’t just immediately throw up or have a brain haemorrhage, you still need to be sure that the User Experience is so damn intuitive that they are able to use it effortlessly without any prompting. This is hard when you don’t know what the hell they are looking at. Eventually you finish the demo, they emerge from the matrix with a smile on their face, obviously very impressed. “How much is it for one of these things?” they ask. “For the headset, or the £3000 PC it’s plugged into?” you respond. Their face drops. Thankfully, the situation is improving: we’re able to run respectable VR experiences on mobile devices with the cheaper headsets, and the standalone VR solutions like the Oculus Go are cheaper than your average high-spec mobile device, and easy to throw in your bag and whip out in a meeting. The only issue we face now is the UX: clients don’t want to install apps, especially when they need to get their IT departments involved. Sales people certainly don’t want to ask their customers to install an app so they can join them in VR for a meeting; there’s nothing more painful than joining a teleconference meeting via a link, and then finding out it wants you to download a plugin, or another piece of software. With these barriers in mind, what options are there for conducting business in Virtual Reality? The Amazon Sumerian IDE running in the browser, and showing a Virtual Host. Credit: Amazon. This year, Amazon launched their new 3d in the browser tool called Sumerian. The tool is part of their Amazon Web Services suite, and runs entirely in a modern browser running WebGL technology —this means you’ll need to download the latest version of Chrome to be sure it will run ok (it should with Safari, Edge and most of the latest desktop browsers). 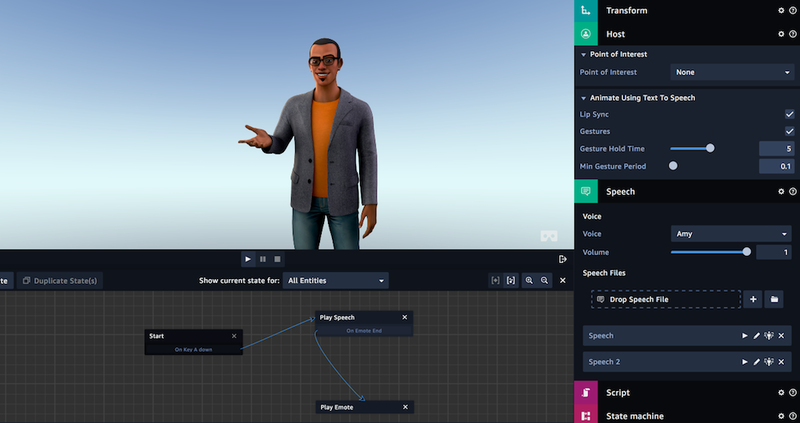 Sumerian is a tool that allows developers to, very quickly, put together a 3D environment, and publish it to the web so a visitor can immerse themselves within it by using a VR headset, or by dragging around in the browser with their mouse, or fingertips. Sumerian has features for building interactive, animated 3d content easily, and can also be used to play video, and slides. It’s main feature, however, are the Virtual Hosts that you can add to the scene, and instruct to converse with your visitors. The hosts can plug into the same technology that runs Alexa on their range of VUI devices; a combination of two API’s from Amazon called Lex and Polly. This is a powerful feature, that allows us to build an enticing virtual meeting room, or presentation space, and have it fully automated as a chat bot, without a need for another human to be present. This is also important because of Sumerian’s main drawback: it doesn’t support multiple visitors sharing the same environment, so is pretty useless as a teleconference solution at the moment. This is high on their priority list though, so we’re excited to see what they do next with it. The Immerse Collaborative VR Platform with multiple participants in the same experience. Credit: Immerse. Immerse are a British company who have built a collaborative VR platform specifically for enterprise. Their licensed SDK allows developers to add collaborative features to their own VR creations, and then publish them as either WebGL experiences in the browser, or more advanced standalone apps running on high-end PC’s. This gives developers much more flexibility —although it’s certainly not as easy to build as Sumerian. I was lucky enough to get a demo of the Immerse platform, and it is very impressive; their tools allow multiple people in the same space to manipulate 3D objects collaboratively, and the WebRTC voice channel was clear, and stable. There’s something very cathartic about being inside a Virtual Reality experience with another person; there’s a sense of presence that helps you to relax and feel assured, but you are still able to hide behind the avatar, which boosts confidence —something you need in a business situation. The Immerse SDK will render a simple a head and hands avatar for each participant, so you are able to see each other in the space, and can also gesticulate, and express yourselves appropriately. The main business case for using Immerse, is as a HR tool, their case studies show a plethora of training scenarios, including an Inmarsat multi-user simulation which facilitates the placement and assembly of a Satellite terminal, allowing training staff to repeatedly demonstrate the assembly and usage of the expensive technology across the globe, without risk of damage to the physical asset. The British Council has also used the Immerse platform to build a language course for young professionals in Saudi Arabia. Immersive virtual environments such as hotels, hospitals, airports, restaurants and conference rooms were created for groups of 10-12. We can start to really appreciate the benefits of Virtual Reality for the Enterprise client when looking through case studies like this, and with the extra benefit of being able to view these experiences in the browser, these barriers to entry start to tumble down. Finally, and in their own words, we have a VR for HR e-learning platform called LearnBrite. They’ve been around for a few years, and are a subsidiary of a Web 3D Technology company called ExitReality. Like Sumerian, the LearnBrite platform, tools and published environments, all run in a WebGL enabled browser, and on VR headsets. Like Immerse, their tools allow multiple people to join in the same 3D environment, and collaborate, interactively with 3D objects, and other media spaces. Virtual hosts like Sumerian (called Actors), and their own text-to-speech API called ChatMapper. Media boards for presenting Powerpoint presentations, or video conferencing, directly within the virtual space. Ready-to-go 3D scene templates that you can easily brand and customise. The ability to host an experience with hundreds of users present (over multiple instances of an environment). Firewall friendly access for stubborn IT departments. Personalised training, and gamification mechanics. This is a proper e-learning platform, as well as VR tool. Extensive avatar creation tools with animated gestures. The avatars are simple, and business-like, with additional Actor uniforms for many types of industry. I was very impressed with the LearnBrite platform; it was slick and stable, and the telepresence facilities were excellent. The platform is targeted specifically at HR departments, as a training facility, but it’s the potential for virtual conferences, meetings, and seminars that make it appealing to other departments. Here at Weald Creative, we’re excited for the future of Virtual Telepresence and Conferencing and are keen to talk to business innovators who are interested in utilising Virtual Reality so they can conduct their business more efficiently within it. You may be a Pharma company looking at ways to put sales reps in a room with Health Care Professionals, without the problems associated with getting in a room. You may be an engineering firm who want to train young apprentices how to operate that huge, scary piece of equipment without lobbing an arm off in the process. Get in touch with us at Weald Creative for a free consultation, and estimate.